In New York, weekends are all about brunches. I’ve decided it’s high-time we Brits adopted this little tradition, and so I appear to be on a mission to scout out the best brunch spots! 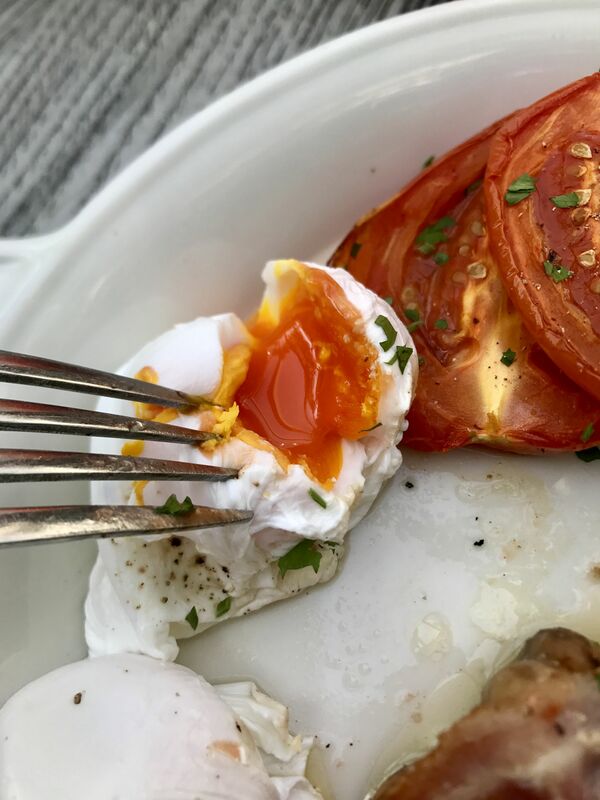 I’ve recently been to Joanna’s in Crystal Palace which, despite being award-winning, I didn’t rate – it all seemed quite expensive, for your standard run-of-the-mill scrambled eggs / salmon etc. I had planned to do a post dedicated to it, but to be honest it was largely “nothing worth writing home” (or in this case, to you guys) about! The girls and I were actually due to hit up No 11 Pimlico Road on the day we wound up at Joanna’s (the usual tale of conflicting schedules and last minute changes!). This bank holiday, I decided to stay a little closer to home, and unwittingly ended up somewhere in the same chain as No 11 Pimlico Road, this time finding myself at No 197 Chiswick Fire Station. 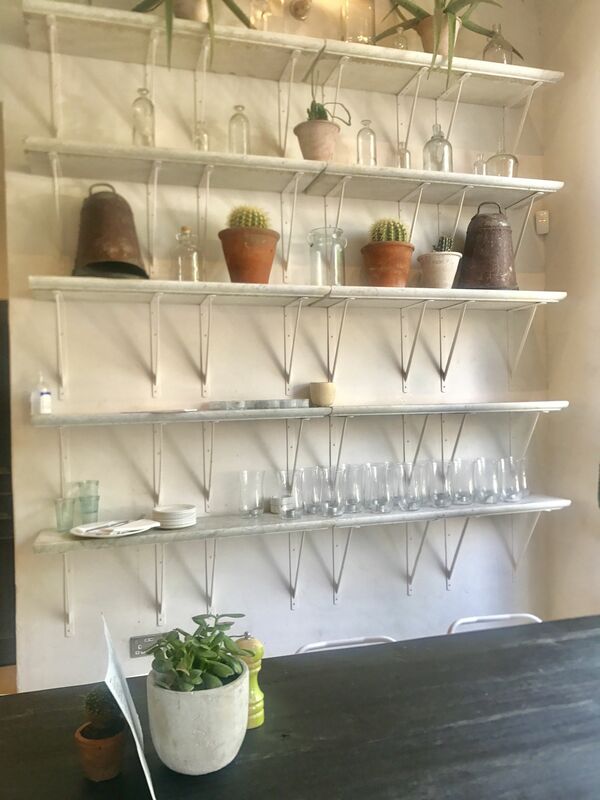 The setting is beautiful – a big bright and air-y room with booths, cute little succulents hanging on the wall, a bar in the middle, and little pops of colour here and there. The real gem of No 197 Chiswick Fire Station, is their secret garden. 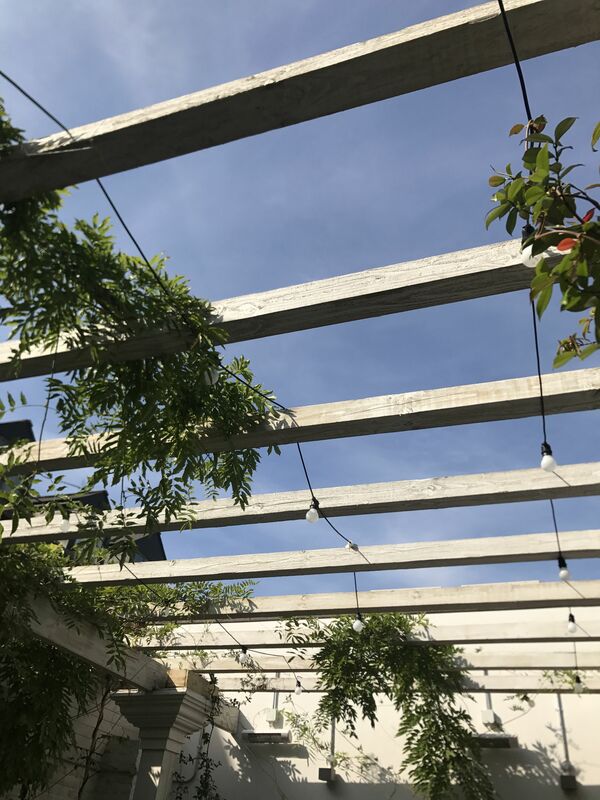 On a sunny day, early in the morning, you’ll find comfy seats, beautiful climbers and the perfectly-instagrammable spot for brunching and catching up with a friend. Service here was slow – although it did improve slightly as more staff turned up throughout the morning. They’d run out of a few things on their drinks menu (we arrived at 930 so I assume they’d run out from yesterday) which was fine, but they only told us once we went to order and not as they gave us the menus. For breakfast, L had grilled sourdough cheese topped with poached eggs and bacon (as delicious as it sounds), and I was a real little piggy and opted for The House Breakfast! Tomatoes, mushrooms, bacon, sausages, grilled tomatoes and two slices of sourdough! Overall the food was great – everything was cooked to perfection. 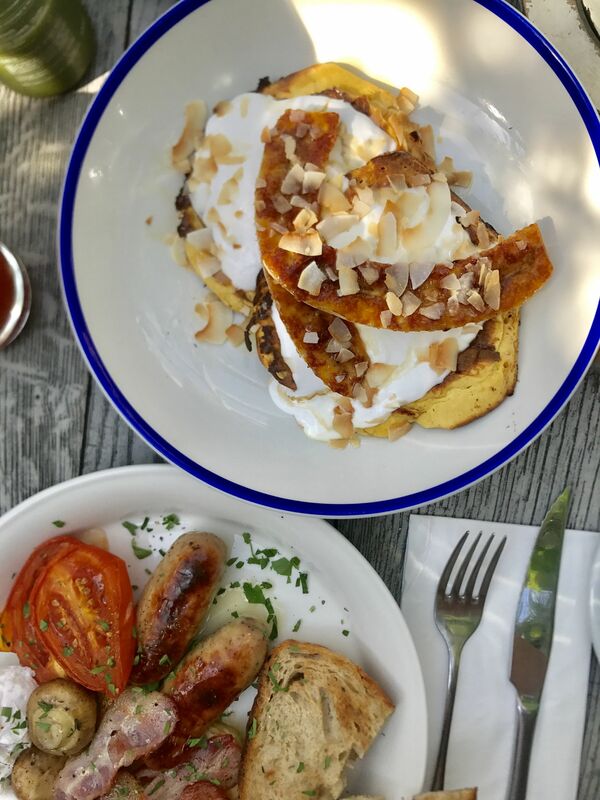 The caramelised bananas, teamed with coconut yoghurt and the fluffiest pancakes was utterly gorgeous and the complete highlight of the meal. There was, however, one ‘odd’ incident, where I found paper wrapping in my food – I mentioned it to the waitress who quite shortly told me it was the butter wrapper, but as you can see from the pics I took when I got my food, there was no butter. We were in a hurry to get going so I didn’t argue, but it was a bit of a shame. Still, when it’s sunny and I’m eating and I’m with my best friend, you can’t keep the smile off my face for long! Overall No 197 Chiswick Fire House food was amazing, but the service needs a few tweaks in order to make it just perfect. 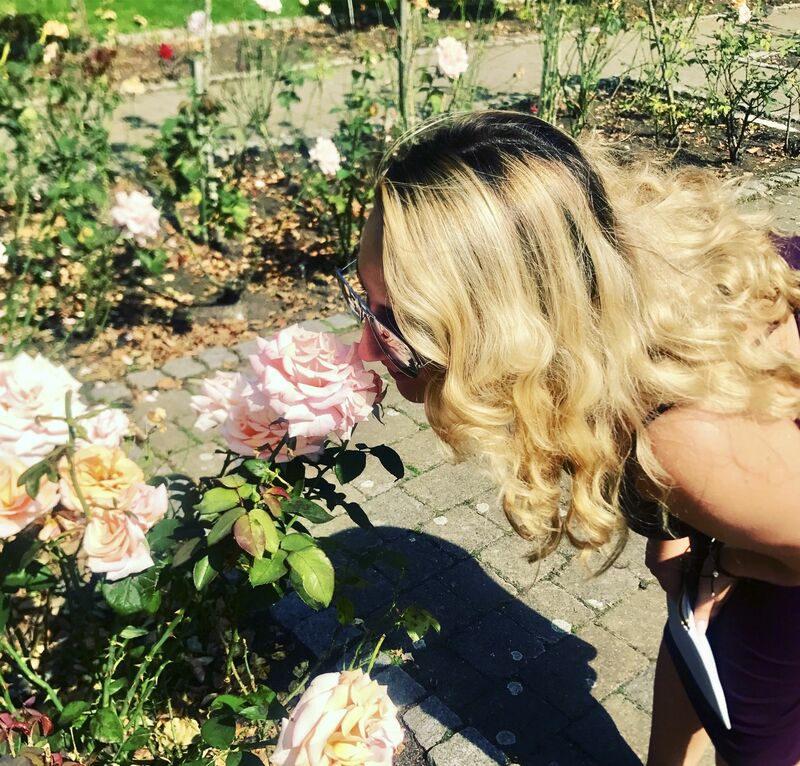 You can also walk through the rose gardens, meander around the vast greenery or just pitch up and have a bite to eat in the cafe. It was surprisingly quiet for bank holiday which suited us just fine! 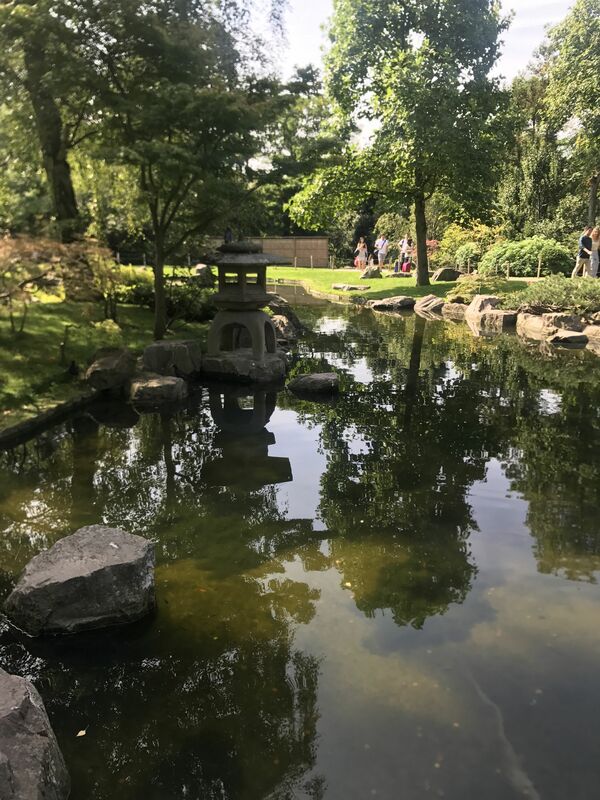 You’ll feel like you’ve completely stepped out of London; it was the perfect place for some post-brunch zen and walking off all that food! Have you been to No 197 Chiswick Fire Station or any of it’s sister restaurants? Also, let me know what you think of Kyoto Gardens! Next Post Indonesian Travel Diary – Sunset At Rock Bar. 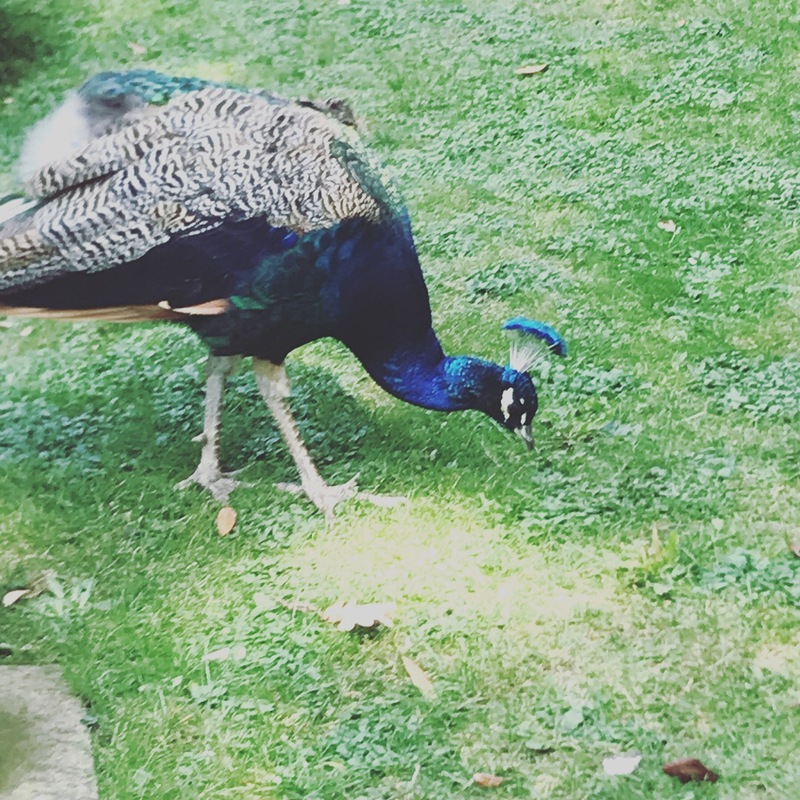 Holland Park seems cool. There’s a place in Scarborough called Peasholm Park which has a sort of Chinese theme and I love it there. Ooh that’s so cool! 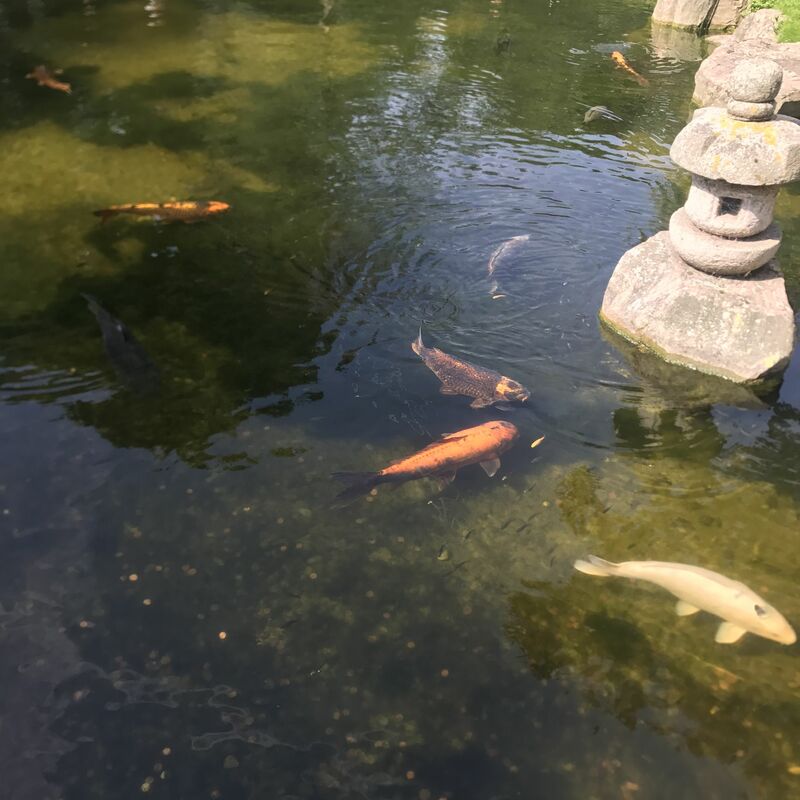 I tried to dig out more of the history of Kyoto gardens after I visited as I think there’s something pretty interesting there but I can’t quite recall off the top of my head! The secret garden and the food look amazing – it’s a shame about the service! I love cafés and restaurants that are unique and a bit quirky. This definitely looks like one of those! If you love brunch, there are a few places in Manchester you’d love if you’re there at all. (I don’t live there but I’ve visited friends there a lot). There’s Moose (which might be a chain? not sure) which does THE BEST brunch – there’s usually a queue to get in! I’d definitely recommend it if you’re ever in Manchester city centre! It is very quirky! It feels quite out of place in London! Ooh thank you for your recommendations about Manchester – funnily enough I’ve been trying to persuade my girlfriends we should head up there for a weekend, Moose sounds amazing; thanks so much for sharing your recommendations with me, Charlotte! Ooh I’m glad I made your Evernote list Finja! Just checked out your blog and love it :-). 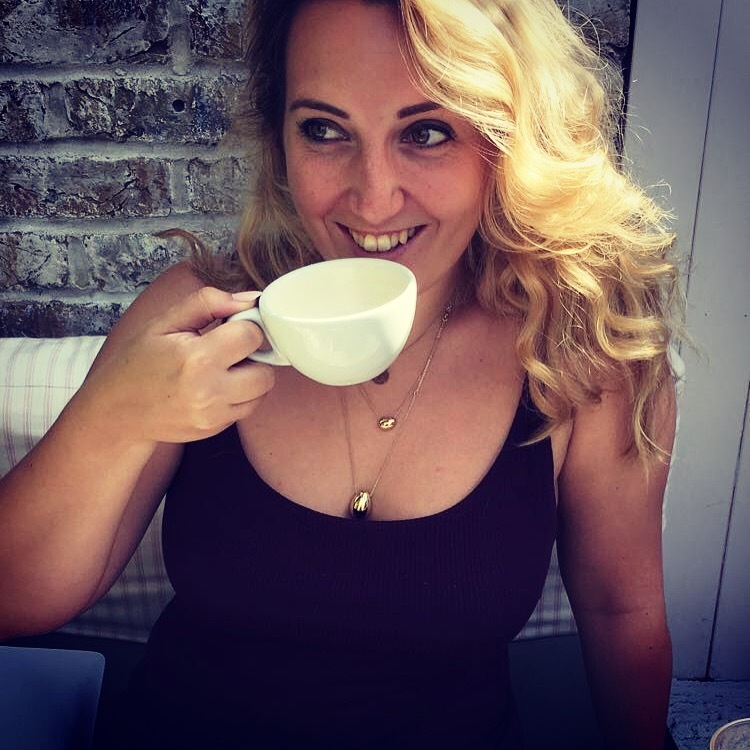 If you’re looking for another fab London blogger check out The Hels Project – she’s fab! 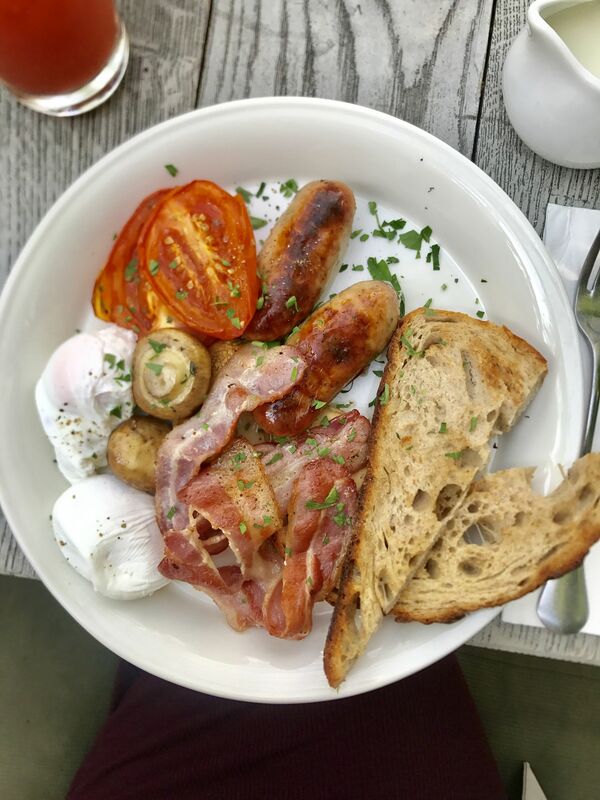 I am completely on board with a British brunch tradition! 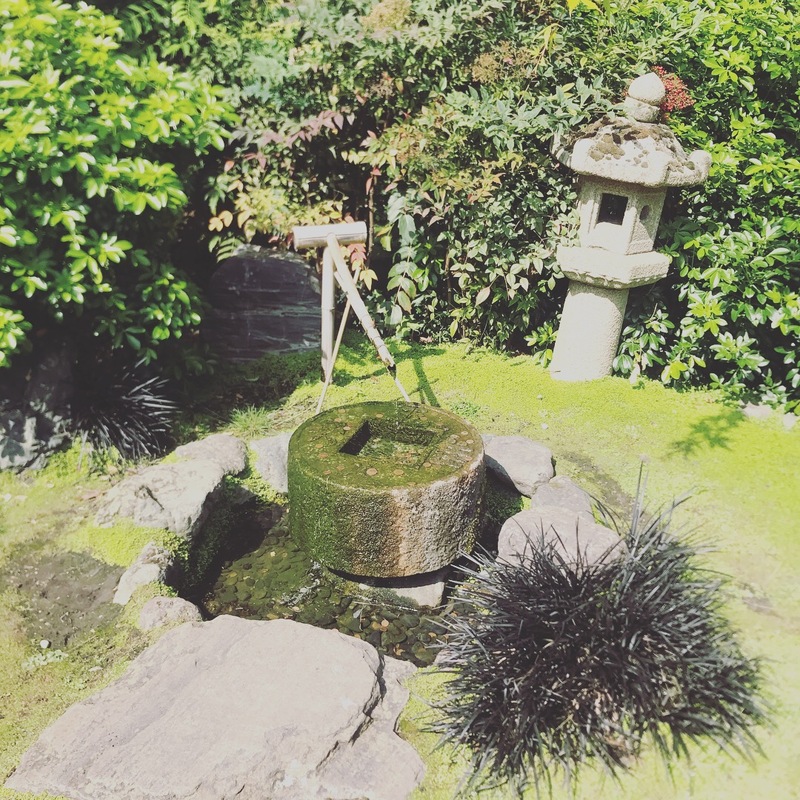 Kyoto Gardens look so tranquil, added to my London to-do list. Oh yay, you would love Kyoto Gardens, they’re so peaceful and pretty! Plus it’s fun to wander round that area as you get to see all the fancy houses! The place that you went for for brunch looks so cool! I love going out for brunch, but I have to admit that I tend to stick to the same few places, I should really change it up more! Those coconut pancakes sound absolutely declious! I’m glad the food made up for the overpriced juice and odd paper incident! I know, I’m always such a creature of comfort, I rarely stray from favourite places! The coconut pancakes were soooo good, I’m desperate to try and recreate them! Yes def give them a whirl! Ooh you need to get in on the brunch trend Jenny, I highly recommend it, and Afternoon Tea is so fab! Amazing photos! The food looks so good ! What a shame about the service! Looks like you still had a lovely morning though! And thanks for being so honest about what it was like service wise etc. 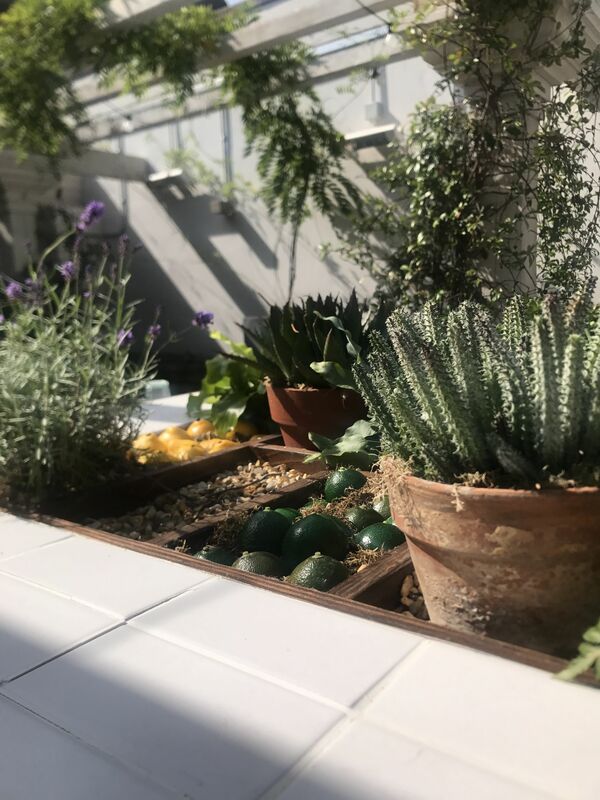 The little garden is so cute! What a shame about the service. The rest of it seems lovely though. I keep meaning to get over to Holland Park, you’ve inspired me to have a lunch time stroll there tomorrow! Oooh def head on over on your lunch break, it’ll give you the perfect tranquil break from work! 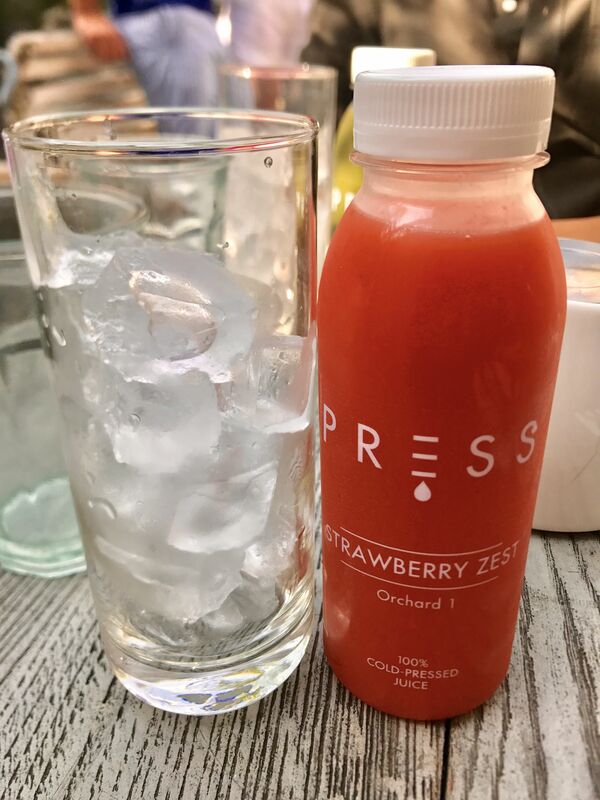 Oh my goodness your photography in this post is incredible and you’re right, that is the most instragrammable brunch spot! Those pancakes look to die for!! A little disappointing about the service but worth it for that incredible food! Those gardens are so pretty too, I particularly like the waterfall! Awww thank you so much for your kind words Rachael! And the waterfall is so beautiful, it’s honestly such a little haven in the middle of London! Woohoo I’m so excited for our trip next week, especially as I hear such great things about that particular venue! The coconut pancakes alone would be more than enough to lyre me back! 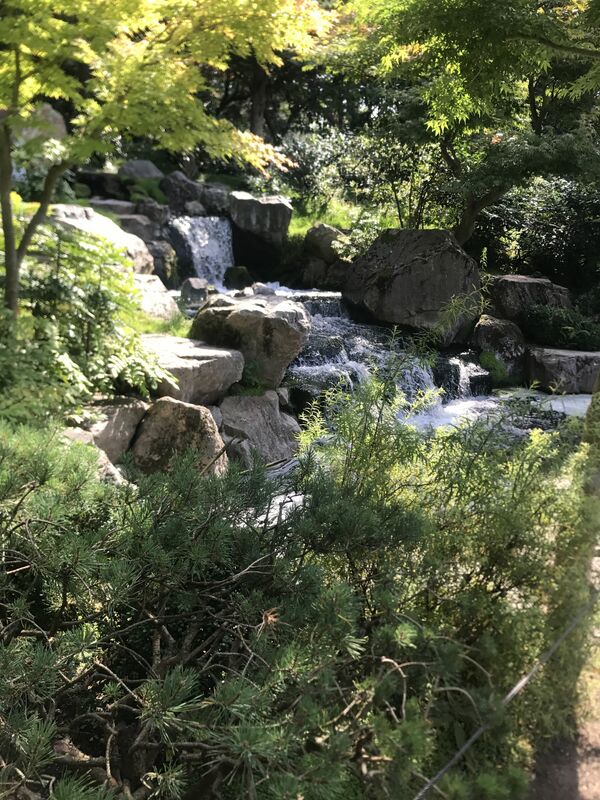 Ahhh the little waterfall was so nice, super relaxing and so nice to be in the heart of London still enjoying the peace and quiet! so jealous this looks amazing! those pancakes look so yummy to! They are so good, def recommend – I keep getting hungry just thinking about them! Ah lovely, that cafe looks so beautiful! 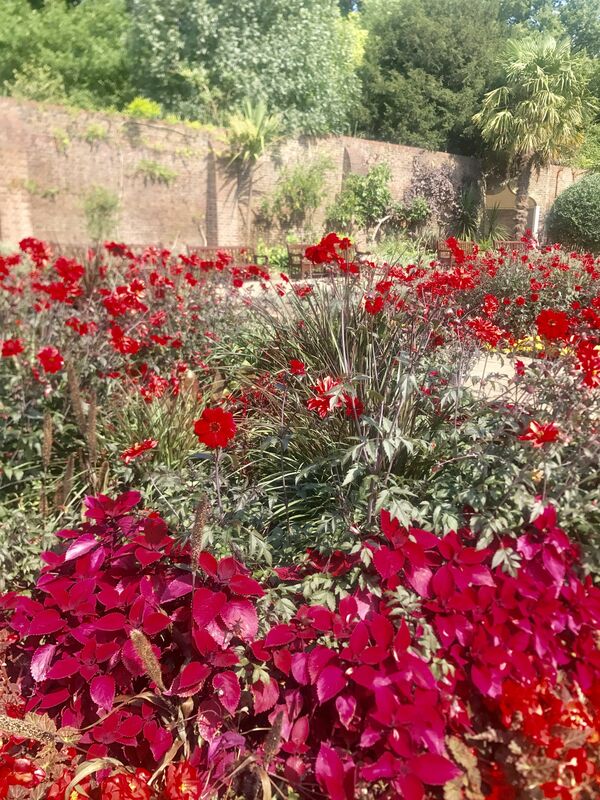 I adore Holland Park as well – it’s such an underrated gem, in my opinion. One of my favourite London parks! A delicious brunch and walk around a rose garden is my perfect way to spend a Sunday. Nothing beats good food and a bit of relaxation. That breakfast looked delicious! Such a pity about finding the paper in it, that was definitely unfair! On a more positive note those rose gardens look gorgeous, definitely somewhere I would like to go!